Why do we have the constant feeling that disaster is looming? Beyond the images of atomic apocalypse that have haunted us for decades, we are dazzled now by an array of possible catastrophe scenarios: climate change, financial crises, environmental disasters, technological meltdowns—perennial subjects of literature, film, popular culture, and political debate. Is this preoccupation with catastrophe questionable alarmism or complacent passivity? Or are there certain truths that can be revealed only in apocalypse? In The Future as Catastrophe, Eva Horn offers a novel critique of the modern fascination with disaster, which she treats as a symptom of our relationship to the future. Analyzing the catastrophic imaginary from its cultural and historical roots in Romanticism and the figure of the Last Man, through the narratives of climatic cataclysm and the Cold War’s apocalyptic sublime, to the contemporary popularity of disaster fiction and end-of-the-world blockbusters, Horn argues that apocalypse always haunts the modern idea of a future that can be anticipated and planned. Considering works by Lord Byron, J. G. Ballard, and Cormac McCarthy and films such as 12 Monkeys and Minority Report alongside scientific scenarios and political metaphors, she analyzes catastrophic thought experiments and the question of survival, the choices legitimized by imagined states of exception, and the contradictions inherent in preventative measures taken in the name of technical safety or political security. What makes today’s obsession different from previous epochs’ is the sense of a “catastrophe without event,” a stealthily creeping process of disintegration. 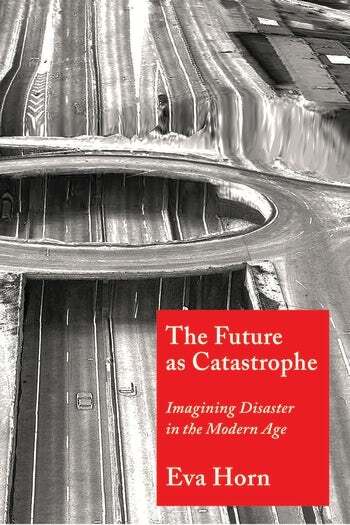 Ultimately, Horn argues, imagined catastrophes offer us intellectual tools that can render a future shadowed with apocalyptic possibilities affectively, epistemologically, and politically accessible. Eva Horn is professor of German literature and cultural history at the University of Vienna. She is the author of The Secret War: Treason, Espionage, and Modern Fiction (2013).